The Animal Friendly License Plate was created when the Oklahoma legislature enacted the Pet Overpopulation Fund in 2004. 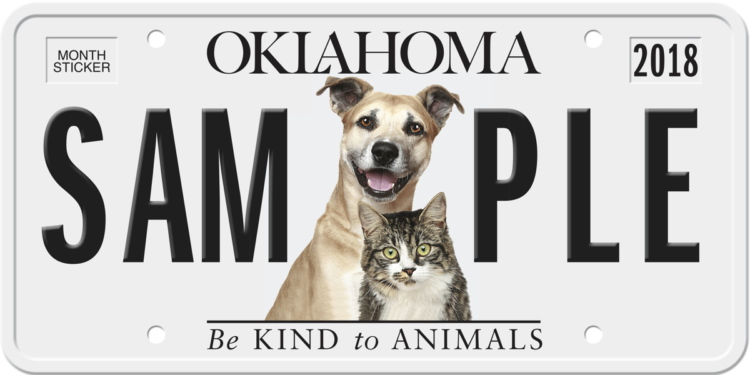 Sale of Animal Friendly License plates is one method of accruing funds to combat Oklahoma’s Pet Overpopulation Crises. $20 from the sale of each license plate will go into the Pet Overpopulation Fund. Thousands of stray and unwanted pets are destroyed annually because there are not enough homes for them. Funds from this program are designed to assist low income families who cannot afford to have their pets spayed or neutered. It will ultimately reduce the number of stray and unwanted pets in Oklahoma. Individuals or families that qualify for low income will be issued a voucher that can be submitted to participating veterinarians for a sterilization procedure. Animal Friendly License plate application forms can be downloaded and printed from the OVMA web site (click on the site below). The application can then be filled out and sent to the Oklahoma Tax Commission. Applications can also be picked up at tag agencies or obtained from the Oklahoma Tax Commission. Another method of accumulating monies in the Pet Overpopulation Fund is an income tax check-off program. This gives Oklahoma residents an opportunity to check off a portion or all of their income tax refund to go into the Pet Overpopulation Fund. Without financial support, the Pet Overpopulation Sterilization program will not be successful. It is a win-win-win situation for everybody. Pets win because it will effectively reduce pet overpopulation and fewer unwanted animals will be destroyed in the future. Veterinarians win because they are assisting with a community problem. The public, state and local government wins because costs associated with stray animals are reduced. These costs include capturing, housing, care, and euthanasia of stray animals; medical costs associated with human bites; costs associated with stray animals injured by automobiles; and property damage from stray animals.